The lost symbols of Adam and Eve have a more interesting twist than the Biblical version could reveal. During a year of solitude, I took dictation from God to receive this amazing story. The story has no back story or acknowledgments, it is just how it was dictated. You’ll wonder what kind of world we would have had, for the last 4,000 years, if Eve’s purpose had not been omitted. The original tale had been told for thousands of years through oral tradition, before it was written down. When it was finally put to tablet, much of it was edited out as a way to govern the people. How can you enslave people who know they are born free? Why was Eve made from Adam’s rib? Is this the first recorded use of adult stem cells? Relief to See Her Arrive; The Lost Symbol of the Adam and the Eve makes more sense than the badly decomposed version that is in the Bible. The Bible story is what remains after the first scribes wrote down a story that had been passed down through oral tradition for thousands of years. When it was finally written down, 2/3rds of the population were slaves. So the editors turned a story about free will into a story of ‘this is what happens when you disobey the master.’You’ll read for the first time in tens of thousands of years what was given to the original Godscribe when she asked about the nature of humankind. Get an amazing account of what humans are in God’s eyes. Are we artificial intelligence? Or slaves to a master? 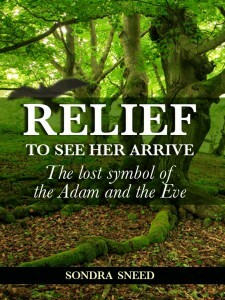 You decide, when you read Relief to See Her Arrive; The Lost Symbol of the Adam and the Eve.